Broken teeth can be caused by several factors, including rot and, more often, impact. This can be due to exercise, violence or even eating certain foods. Strong gums will help ensure that teeth stay put, and enamel will help protect them. However, sometimes breaks are unavoidable, even with healthy teeth. If you have broken a tooth, do not panic, as this can cause an increase in bloodflow. See a dentist right away if you have broken or chipped a tooth. If you cannot see a dentist right away, there are a couple of things you can do at home in the meantime to decrease both damage and pain. If you are in pain, take an over-the-counter pain reliever such as aspirin. Be sure to follow dosage directions on the bottle. If the chip or broken tooth is jagged, you should try to make a "homemade implant" to reduce the sharpness. A sharply jagged tooth can cut your cheek or tongue and do further dental damage. At home, you can affix softly chewed gum to the end of the broken tooth. Depending on the severity of the break or chip, a dentist may choose to repair a tooth with a filling or bonding. A filling can be used for non-visible teeth. It is often made of less expensive materials than bonding. A filling can often be completed in one simple visit and will fill in the gap in the tooth, and the dentist will grind the tooth into an appropriate shape. If a tooth is chipped or broken and it is visible, a dentist will use a bonding method to repair it. Bonding repairs the tooth itself and restores functionality, as well as aesthetics. Bonding uses a liquid gel to form the shape of the tooth, and it is tooth colored, so it can be made to match the shade of other teeth and look completely natural. Bonding does not require any local anesthesia. Your dentist can consult with you to decide if a filling or bonding will be best for restoring a broken tooth. A crown may be used if a significant piece of the tooth has been chipped off. 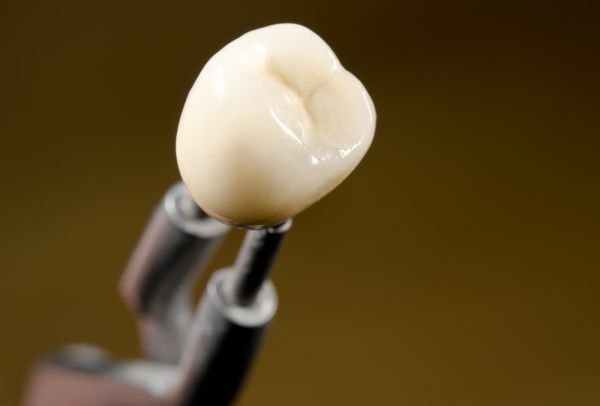 A crown is a tooth-shaped cap that can restore aesthetics and functionality. A crown will take several appointments to affix because a dentist needs to create a form that matches the tooth. This can usually be done with two appointments: one consultation and one implantation appointment. Crowns can be made of different materials, including porcelain or gold. Costs vary and are usually based on cosmetic consideration, depending on which teeth have been chipped or broken. If you have broken or chipped a tooth, you should see a dentist right away. If you have to wait, there are pain-relieving and temporary strategies you can employ. When you see a dentist, they will provide a consultation to decide what type of restoration method is best for you. Call (425) 249-9186 today to reach Bellevue Implant & Cosmetic Dentistry. « Which Dental Filling Material Type Is Most Often Recommended?